This one-time fee (frozen on Merchant's Alipay account) is used as collateral in the case of any damages incurred by Tmall.com or any customer, unfrozen upon termination of the Tmall.com Service Agreement. Tmall.com reserves the right to deduct from the Deposit an amount equivalent to the damage incurred by Tmall.com or any customer. Should the Security Deposit be less than the required amount, the merchant must cover the difference within 15 days. Should the merchant exceed the deadline, Tmall.com will close the store until the payments are received. This fee is payable to Tmall.com yearly for services rendered. This fee is dependent upon the merchant’s registered primary category and is refundable if certain conditions are met. - Merchant's signing or renewing contracts in 2012 will pay the stated 2012 annual fee if renewing before December 26, 2012. Merchants signing or renewing after December 26, 2012 will be subject to the 2013 annual fee. As encouragement for merchants to increase their quality of service and grow their businesses on the platform, Tmall.com will conditionally return the annual technology and service fee. The fee return is dependent on two requirements: Detailed seller rating (DSR) and annual sales (not including shipping). In order to acquire annual fee return the merchants must achieve annual sales requirements (two refunding levels: 50% or 100%) and in any circumstance the DSR average must not fall below 4.6. The yearly sales requirement is dependent upon the sum recorded in the "Transaction Successful" account during the time period stipulated in the agreement. The annual fee will not be returned in the case of the advertising or selling of counterfeit goods or any other rule infringing activity. Should the Tmall.com Service Agreement be terminated by either party’s written notice or because of the merchant’s failure of fulfilling its obligations in probation period, Tmall.com will calculate the amount of annual fee return based on the actual operating period of the merchant. 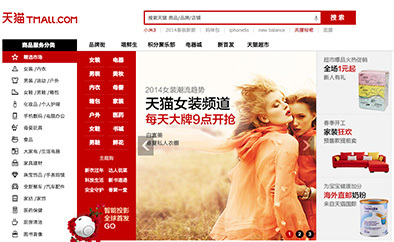 If the merchant and Tmall.com's agreement becomes effective within 2013, the first month is exempted from the annual fee. The cumulative sales figure measured at the end of the year will begin counting the first day the store opens on Tmall.com. If the time period of the merchant and Tmall.com's agreement extends beyond 2013, sales figures from 2013 will not be included in the next year's calculation of total sales: The "Transaction Successful" account's cumulative figure will not include sales from 2013. The annual fee return will be made after the termination of Tmall.com Service Agreement. The "New Car/Second-hand Car" category yearly fee is stipulated in the merchant's signed "Tmall.com Service Agreement". Merchants applying for multiple categories will pay the highest annual fee of the categories they are operating, however when calculating the amount of annual fee return it is based on the category with the highest sale volume. There is an additional 0 .5% deduction (or higher at merchant’s discretion)per transaction which accumulates for Tmall.com to reward consumers in future promotions. Tmall.com charges a small commission fee based on the category of the product sold.